On his birthday, Alex is given a sickly sweet book called Birthday Bunny by his gran. It must be too boring for him, because Alex takes his pencil to the book and draws all over it, completely changing the story! He modifies the illustrations and changes the text, adding in his own lines as well. Birthday Bunny is quickly transformed into the more interesting and suspenseful Battle Bunny! This book is actually two stories in one - three, if you count the original, yet bland, Birthday Bunny tale! On the surface, there is the story of Battle Bunny, but older readers will be able to appreciate the underlying storyline of Alex changing the book himself. The story of Battle Bunny is interesting, but the best part is the illustrations and overall book layout. It’s fun to search each page for what Alex added to the pictures and text. He ever wrote on the copyright page and the back cover. The original illustrations are beautiful, sweet cartoons that looks like a classic picture books. Alex’s additions actually look like pencil marks - you’ll be tempted to take an eraser to them just to see if they’re real! This book will inspire children to use their imaginations more - not just when they’re playing by themselves or with friends, but also when they’re reading! It shares a great message that you don’t have to read just the story on the page - you can also make up your own adaptations! This book was interesting to read aloud to my five-year-old stepson and six-month-old son. They both might be a little too young for it (well, one DEFINITELY is! ), because most of the enjoyment comes from seeing what was scratched out. The pictures are greatly embellished, though, so kids can really get a lot from looking at the illustrations and seeing what Alex added on to them. When reading aloud, my fiancé read the main story, and when a lot of a line was scratched out, I said “Instead of…(original text).” It was a little awkward to read that way, but we wanted to make sure my stepson realized the story had changed, and since he asks questions and points things out during storytime, it wasn’t the worst way to read aloud. The five-year-old originally didn’t want to read this book - my fiancé and I pushed it on him a bit, because we wanted to see it since we saw Jon Scieszka in August 2014. We thought it sounded like a great book, but couldn’t find a copy anywhere until our last library visit. My stepson got into the book as we read it, and afterwards he played “Battle Bunny” for hours, as if he were a superhero! 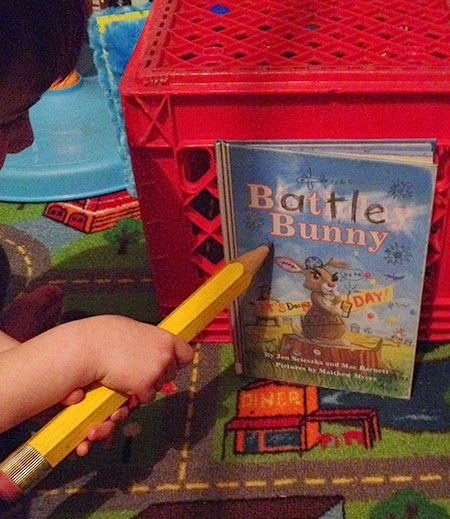 The authors, illustrator, and publishing company behind this book are so brilliant, they set up MyBirthdayBunny.com, where kids can go and explore the pages of Battle Bunny - and make their own version! You can download the book and print off the pages so kids can make their own versions of the story! If you’re especially proud of your creation, you can email your work to the site and they’ll share them on the Battle Bunny Tumblr!